Next Cafe: What’s the Point of Private Property? If we listen to politicians, then prosperity, security and even happiness would seem to be impossible without owning things – and, moreover, owning lots of them. Others suggest, however, that without private property, there would be no inequality, and more social solidarity – not only making us happier, but producing a more just way of living together. The proposition that owning things is basically antisocial and even immoral is summed up nicely in Pierre Joseph Proudhon’s infamous phrase, “La propriété, c’est le vol“. In this cafe session, led by Dr Chris Groves (Cesagen, Cardiff University) we’ll explore the historical roots of the concept of private property, consider arguments from its supporters and detractors, and reflect on what exactly “having stuff” contributes to our well-being. The event will take place at The Gate, Keppoch Street, Roath, from 8.00pm on 18 October. Entrance is free. Previous post: Cafe Report: Economics vs Ecology? 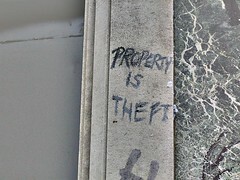 Next post: Poll: What’s the point of private property?